FAYETTEVILLE, Ark. 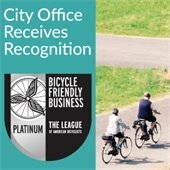 — The League of American Bicyclists recognized the City of Fayetteville’s Sustainability Department office on April 6 with a Platinum Bicycle Friendly Business (BFBSM) award – one of only 36 businesses in the nation to receive a platinum designation and the first such award in Arkansas. The Sustainability office joins 1,315 local businesses, government agencies, and Fortune 500 companies in 49 states and Washington, D.C., that have earned bronze, silver, gold or platinum designations. The League ranks Fayetteville third in the top ten cities with bicycle friendly businesses per 10,000 residents. The Sustainability Department moved into a new office space in the City’s Spring Street Parking Deck (northwest corner of Spring and School intersection) during the fall of 2016. Three full-time employees, one part-time employee, and an intern occupy the space. “The Sustainability Department tries to set an example for how employers can provide access to alternative transportation options in Fayetteville,” said Peter Nierengarten, department director. “When employees can bike and walk to work, great things happen – we decrease our carbon footprint, reduce healthcare costs, connect to our local community, and create a fun and healthy work culture.” Office amenities include covered bike parking, a shower with changing area, and easy access trails to encourage employees to bike to work, to and from meetings, and to ride for exercise during off time. In addition to being bicycle friendly, the office features several other sustainable features such as furniture made from recycled materials, high efficiency HVAC, and LED lighting. To apply or learn more about the BFB program, visit the League of American Bicyclists website or contact the City’s Sustainability office by phone at 479.575.8211. For information about bicycling in Fayetteville, please visit this City webpage. Copyright © 2016 City of Fayetteville, Arkansas. All rights reserved.